The business sector dedicated to the pick up and delivery of goods is, in today's economies, a booming sector. Online purchasing and home delivery are becoming more and more common, and the customers are increasingly more demanding in regard to the speed delivery of the product purchased. Therefore, qualities such as efficiency, seriousness and fulfilment of the agreed dates have become the most important qualities for the companies in the sector. For this reason, incorporating to your business activity a tool like Routing Reparto, which is a software specifically designed for the control and optimization of your company's vehicles movements, will mean an exponential improvement in all the aspects of your business. On the one hand, you will be able to plan efficiently the routes of pick up & delivery, and on the other hand, you will be able to implement a tracking module that will allow you to know in real time the activity of your business throughout the day. 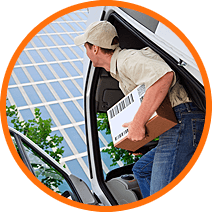 Specific logistical calculation for your business, taking into account multiple factors such as working hours, the vehicle's load capacity, the type of vehicle, the different needs of the pick up or delivery service, etc. Optimize the processes of maintenance and replacement, by reducing the duration of each trip and increasing the work capacity of your vehicles. Better planning of routes with automatic assignment of the customers. Automatic reporting of activity to learn more about the operation of your business.